Match Olympiacos-F91 Dudelange Europa League the fixture is set to kick-off today 20:00 on Karaiskaki Stadium. Refereee . Team Olympiacos is located in the middle of the table. (3 place). In 5 last games (league + cup) Olympiacos get 8 points. In this season games Europa League the most goals scored players: Guerrero 4 goals, Lazaros Christodoulopoulos 4 goals, Konstantinos Fortounis 2 goals. They will have to be well guarded by defense F91 Dudelange. Players , Konstantinos Fortounis 4 assists will have to be very well guarded by defenders F91 Dudelange, because they have the most assists. Team F91 Dudelange currently is on lower place in table (4 position). In 5 last games (league + cup) F91 Dudelange get 6 points. F91 Dudelange from 3 matches can not beat any rival. Players F91 Dudelange in Europa League with the highest number of goals: David Turpel 4 goals, Danel Sinani 3 goals, Patrick Stumpf 2 goals. Players David Turpel 1 assists, Patrick Stumpf 1 assists will have to be very well guarded by defenders Olympiacos, because they have the most assists. Direct matches: Olympiacos won more direct matches. 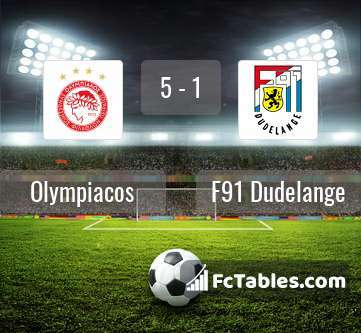 Olympiacos won 1 matches , F91 Dudelange won 0 direct matches, was a 0 draws. In 0 matches the sum of the goals both teams was greater than 2.5 (Over 2.5), and 1 matches teams scored more than 1.5 goals (Over 1.5). In 0 matches the both teams scored a least one goal (Both teams to score).